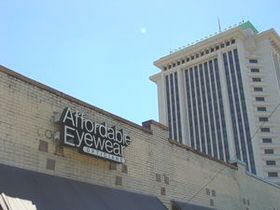 Affordable Eyewear :: Welcome to Alabama's Source for Eyewear. Friday, September 28, 2018, our downtown Madison Ave location closed, but, we continue to operate our store at 173 Eastern Bypass in Montgomery. This new location is smaller and located in the most convenient shopping center in Montgomery, with lots of free parking! For the immediate future, there are no plans for a West Montgomery Location. It has been a whirl wind of a ride to this point and I want to thank all of you for your support over the last 6 months. It has been over the top. If you have never used Affordable Eyewear, you probably paid too much for eyewear. (See our Two Pair Everyday Special!) Look at our frames and lens prices. Everything we sell along with our service is designed with you the customer in mind. We guarantee the Best Quality and Best Price, on everything we sell. Most of our customers purchase 2 pair of glasses when they buy their new eyewear. Bring your eyeglass correction to Affordable Eyewear. Affordable Eyewear displays more frames than any other optical outlet in Central Alabama. When you come into Affordable Eyewear the Opticians and will guide you through acquiring the highest quality eyewear you have ever purchased. No eyeglasses leave store without first being custom-fitted to your face. We are always here for adjustments and repairs when needed. Most of these services are free to our customers. There is a federal law protecting your right to compare prices and shop for the best possible price and service. See the Eye Glass 2 [http://www.ftc.gov/opa/1996/05/dr-eye.htm] case studies. The actual rule. Will your plan violate this federal law? Does your vision plan allow you to shop for the best price? Does it tell you to purchase your new eyewear from a selected provider thus giving you no choice? We encourage you to check into this. We accept Viva Medicare. . Affordable Eyewear accepts Viva Medicare when eyewear is indicated. Eye Exams. Available at both locations. Parking was the main reason we were looking at moving. But the property will be raised and a large convenience store & gas station is in the plan. "I did not think it was fair for you my customers to dodge 15.00 parking meters. Since the redesign of Madison Avenue it is not safe to get out of the car."